Amica Insurance collected 20,309 canned food items during its Giving Thanks Giving Back food drive, which ran from Friday, Nov. 3, through Friday, Nov. 17, at its corporate headquarters. Those items were donated to the Rhode Island Community Food Bank to support families in need this holiday season. Amica Insurance collected 20,309 canned food items during its Giving Thanks Giving Back food drive, which ran from Friday, Nov. 3, through Friday, Nov. 17, at its corporate headquarters. Amica kicked off the food drive in conjunction with its annual Thanksgiving card unveiling on Nov. 3. 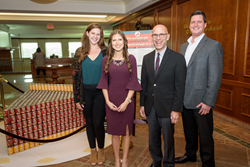 Each of the four buildings at Amica’s headquarters was assigned a canned food item, and the buildings competed to see who could donate the most items over a two-week period. Building 25, which is home to Amica’s corporate services and corporate information systems departments, won the competition by collecting 5,493 items. Amica also partnered with Canstruction® Rhode Island to build a piece of pumpkin pie out of approximately 2,000 of the canned food items.